“I would never say that,” I murmured, voice trembling, to the other girl’s teacher. The woman bent down, peering into my face. If she’d been my homeroom teacher or if I’d ever had a class with her, she would have known me, would’ve known that I tended to be the teacher’s pet, without even intending to. I was quiet, studious, helped the other students, made no trouble. But today, right after our morning recess, I was in deep trouble. I squinted beyond her skirt at my fellow ten-year old smirking behind her. Virginia went to the church down the street from me, two small town blocks away. She usually dressed for school exactly as she did for church: pastel dress, lace collar, lace crinolines—who the hell ever wears crinolines?—bobby socks, and white patent leather shoes in the springtime. The only difference in school attire was that she was absent the white lace gloves which she displayed delicately with her hands perpendicular to her sides and parallel to the ground. It was the same style of clothes she was to wear well into her teenage years. “I didn’t tell her to go to Hell,” I murmured, barely audible to my own ears. “Are you saying Virginia is lying?” As if that could never be the case. Silly teacher. Virginia’s parents were rich and I was a farmer’s kid. Virginia, behind her, let out a squawk. I may have been teacher’s pet for my teacher, but Virginia was this woman’s pet. Virginia twisted her fingers and palms together behind her back, stood on one foot, and twirled from side to side. “I don’t know what she’s talking about,” she answered calmly, looking away. “She called me a fool,” I blurted out. “Did not!” Virginia protested again. “Girls!” the teacher yelled over both of us. Or not done, I thought to myself. Miss Prissy-Popular Girl had given me a direct order, and I’d refused it. And think about it, I did. The night before, I had been at a special Tuesday night revival meeting over at the Rocky Ridge Baptist Church. Not my church, but my cousins’ church. My aunts and uncles had insisted my parents attend a special film that Tuesday night on “Communism and Christianity.” I don’t remember much about it now, except for one scene: a beloved grandfather had been hogtied over a pit of pitchforks by the Communist antagonist in this “documentary” for Christians, and the other end of the rope had been given to three small children, the oldest about my age, who could not hold the rope tight and far enough away for long enough. They were given the option of having help of rescuing their grandfather, but only if they would renounce God. I watched in horror, with my parents, as the film on the wall of the church sanctuary displayed the children refusing to renounce God and screaming in grief as they lost the battle with the rope and gravity, bloodied their hands as they tried to hold onto the slipping rope. The film felt real to me and made a big impression on ten-year-old me: I was not then, nor have I ever been, one to renounce what I believe. For the rest of that year and for the rest of elementary school, and even for the rest of middle school, I thought about the day Virginia had called me a fool and how I had responded to her. I studied everything I could find on Matthew 5:22. Decades have passed since that day on the playground. Now that I’m all grown up, that verse has come back to me. After much study and discussion with Bible scholars, ministers, and deacons, the interpretation that I settled on for this passage was that the various offenses outlined were punishable by law or by council, yet one in particular was punishable by Hell, even if the person committing this act was a Christian. As we know, most Christians think they’re going to Heaven simply because they, according to the tenets of Christianity, believe in Jesus and have accepted him as their savior. However, this verse paints an entirely different picture so that even a Christian can go to Hell, or be in danger of it, for committing the simple act of calling someone a fool. In various other interpretations of this passage, especially the part of calling someone a fool, I came across something even more interesting. That this passage meant if you gossip against someone, put them down, tell lies about them, then that is the same as calling them a fool. That this passage is about gossip, about brutal gossip. About the kind of gossip that changes a person’s life, and maybe even their eternity. I know what you’re thinking. Nah. God wouldn’t send a good, law-abiding, church-going Christian to Hell merely for vicious gossip. Would He? I’ve thought a lot about that question recently, especially over the last few months. My belief system is not something I’ve ever renounced. It just gets deeper, broader, loops around, doubles back, comes full circle. I’ve thought quite a few times over the last year that I would like to become involved, again, with the Christian community because I understand it in a different way now. And, again, I’m not renouncing any of my current beliefs in saying this. I understand it in a different way because I’ve been in other places. 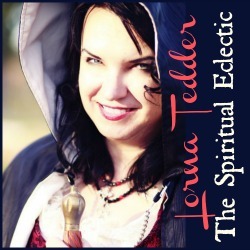 I understand other spiritual beliefs now, the commonalities that I never would have seen before. People who know little to nothing about me but rumor will not believe this, but nothing has ever really fundamentally changed for me spiritually except that I’ve explored soul-work more deeply than some of the small-minded people that litter these little towns in the South could ever understand when they’re rather focus on fashion in church than on the real meaning of our existence. What stops me from going back the kind of church I grew up in? “Good Christians” who gossip viciously. Well, it’s more likely that they would never actually let me through the church doors, regardless of what their Bible instructs them to do. I’m not sure I could stomach sitting on the same pew with some of the “Good Christians” who have told such dark and mean lies about me, and others who have made up fantastical stories of what they thought I believed and set out to destroy the things I’ve built without ever asking me what it was I built or why. If they believe I’m going to Hell and take actions against me because of their belief that I’m going to Hell and I find those actions so reprehensible that I would never go near their church, that I have felt driven away from any possibility of it, then perhaps their actions should be punishable by hellfire. By their own words, they believe that those who do not share their beliefs will burn in Hell. Yet, by their actions, whether vicious gossip or bullying or both, these same people are guilty of keeping others from ever sharing their beliefs. To this day, not one of the people who have called me a fool for my beliefs and dogged me mercilessly for them has ever asked me to explain what it is I do believe. Nor is it my responsibility to keep them informed. Then again, what would it matter what I believe? What should matter to them is this: how often do they keep other people from the religion that they have been commanded to proselytize for? 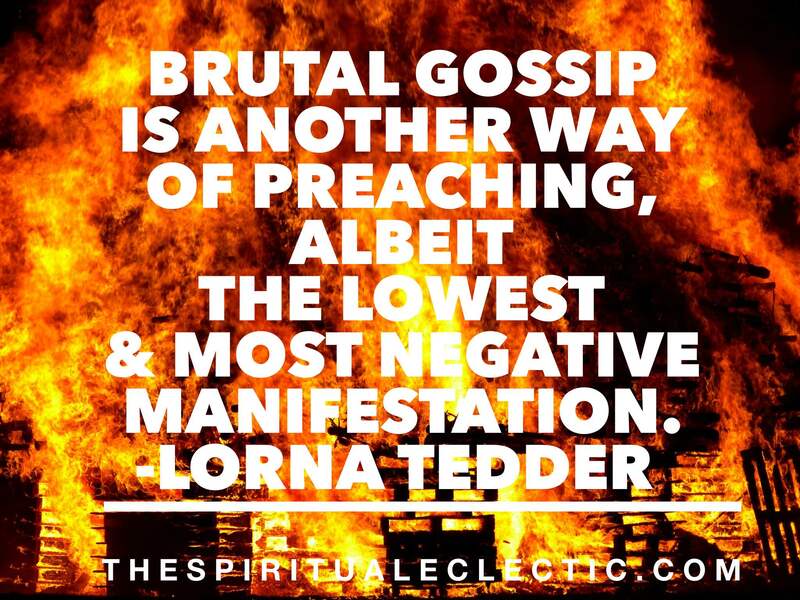 Brutal gossip is just another way of preaching, albeit the lowest and most negative manifestation. I’m pretty sure he wouldn’t be texting his disciples to tell them the latest scandal on Lorna Tedder.